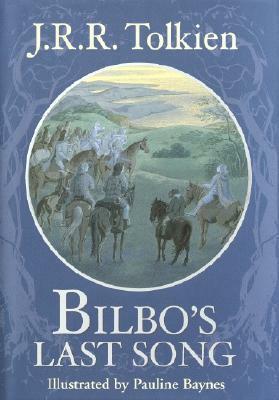 Bilbo's Last Song is considered by many to be Tolkien's epilogue to his classic work The Lord of the Rings. As Bilbo Baggins takes his final voyage to the Undying Lands, he must say goodbye to Middle-earth. Poignant and lyrical, the song is both a longing to set forth on his ultimate journey and a tender farewell to friends left behind. Pauline Baynes's jewel-like illustrations lushly depict both this final voyage and scenes from The Hobbit, as Bilbo remembers his first journey while he prepares for his last. "Bilbo's Last Song is considered by many to be Tolkien's epilogue to his classic work "The Lord of the Rings. As Bilbo Baggins takes his final voyage to the Undying Lands, he must say goodbye to Middle-earth. Poignant and lyrical, the song is both a longing to set forth on his ultimate journey and a tender farewell to friends left behind. Pauline Baynes's jewel-like illustrations lushly depict both this final voyage and scenes from "The Hobbit, as Bilbo remembers his first journey while he prepares for his last. J.R.R. Tolkien was the beloved author of The Hobbit and the masterpiece trilogy The Lord of the Rings. He died in 1973 at the age of 81.